As someone said being the star of a day is simple but being the star for future should take a long way to leap off. Why being a one day star? We may try for something different to keep her ‘our bride’ the unique of all time, keeping all the cultures and ritual considerations intact and choosing the best of the best for her. In the present world we see the people go behind the good and the best, which is evident from the examples all around, people love uniqueness hidden in every day thingy. Let it be a kannadiga or a keralite, a northi or a southi, in India people love integrating their cultures among them. If it were not so, we would have never seen a mallu in a salwar and kamees or an Indian in shorts and shirts. It is to be appreciated, the efforts of an Indian to conserve his culture embracing others on the other hand. Yes …he is always and always at the heights. Being the marriage the great event of one’s life, why not we bring up this feel of national integration for a better outcome even if not for the main but at least for the sub. Here we go for the best ever done choice for a bride, the better one to be sorted to make her show off an excellent persona for the day for which she matters everything for the crowd. The elegant magic, the peace white touch with mild glitters or the traced beauty for the curves. 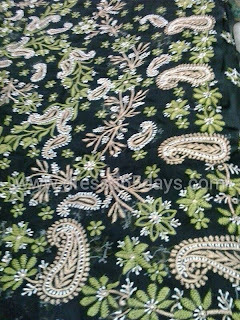 For an occasion which is so special rather divine, it is always and always the best to go for such combinations that look simple pretty and costly, the threadwork of chikankari saris could give you the best solution in this case. It is of no doubt a bride in a sandal wrap of attire or in a golden wrap will look so pleasing and great on the special day meant for her. Whilst often there utters a claim that the outfit like lahangas and thread work sarees for the day of marriage is the monopoly of the north but still if it outsmarts at heights, a very soothing wide choice will all time rely in the choice of such clothes at least for the reception to bring out a pleasant change in the look of the bride. The simple hard artistic works of the molders will give a sense of pride and will obviously manage to make up elegant great make ups with golden, diamond or platinum wears. 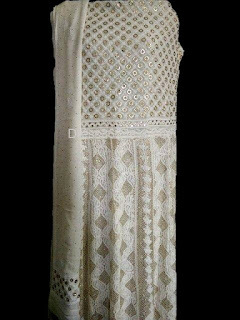 People will love to see a bride in chikankari drape.The so called affinity of the common to chikankari outfits is itself evident from the response that Manish Malhotra, the mentor of this skill in LFW. Yet there we have, a long way to make special every moment, eve or day with the awesome creativity of India, the lucknowi touch.